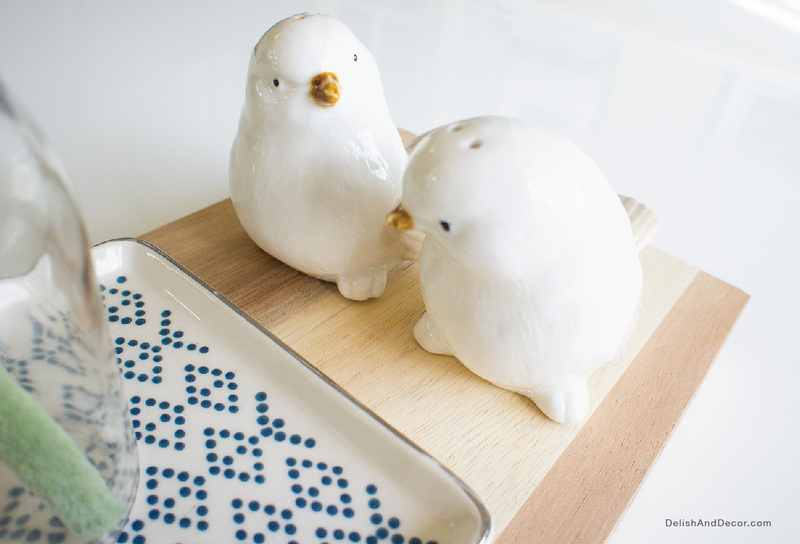 For the dining room, I wanted to create modern, simple and contemporary look with a warm and friendly vibe. Our home has an open concept floor plan and we don’t have a formal dining room. So this space will be used for all dining purposes. 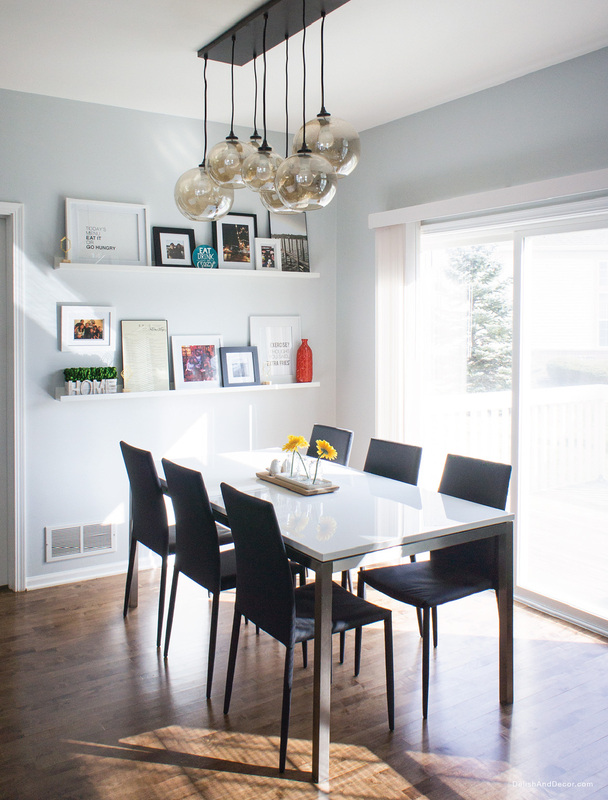 This might sound, odd but one of the must-haves when I was looking for a new home is that the dining area have to be able to fit a long dining table (for 6-8 seating). It’s much easier to have a gathering with family and friends in a long table. I started off by picking the big furniture that would go into the space first then add decors and accessories. I chose this white glossy tabletop with stainless steel frame and legs. I love the clean look and the contemporary design of this dining table. This table also serve as a functional piece with 2 additional leafs that can be extended up to 8-10 seats (seating is 6 normally). Perfect for extra guest. 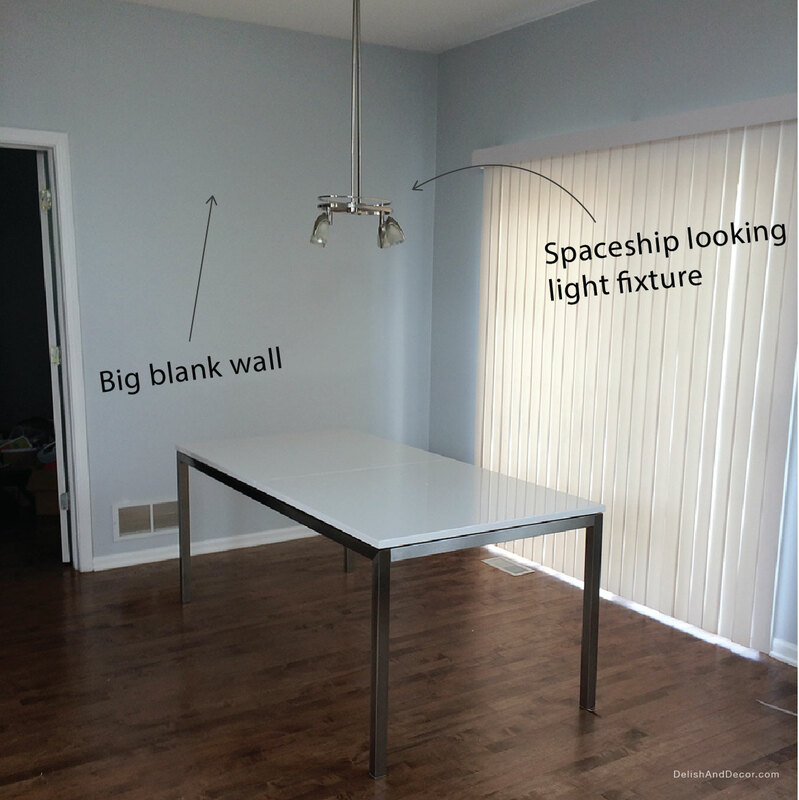 We replaced the spaceship looking light fixture with a beautiful glass orb chandelier from West Elm. The round shapes of the chandelier will help soften the space. 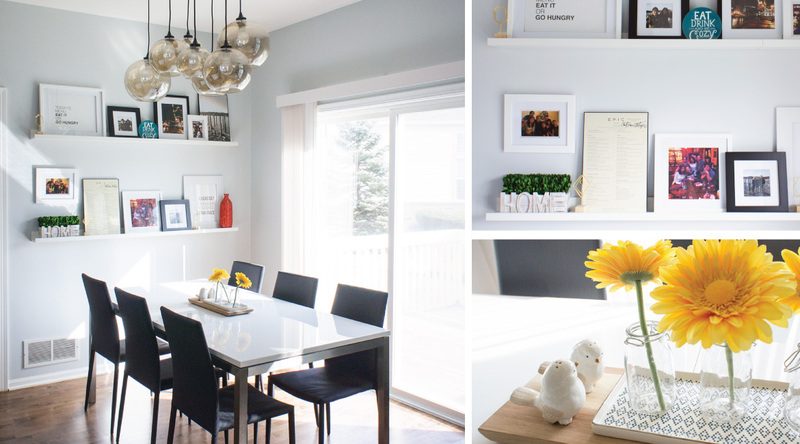 The new chandelier also became a focal point of this space. 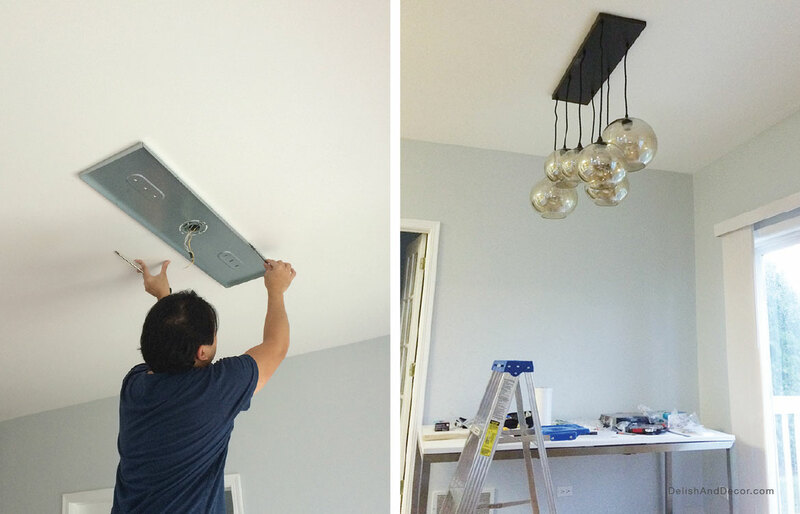 Changing light fixture can change the tone of the room. Look for the one that you really like. Shop around. 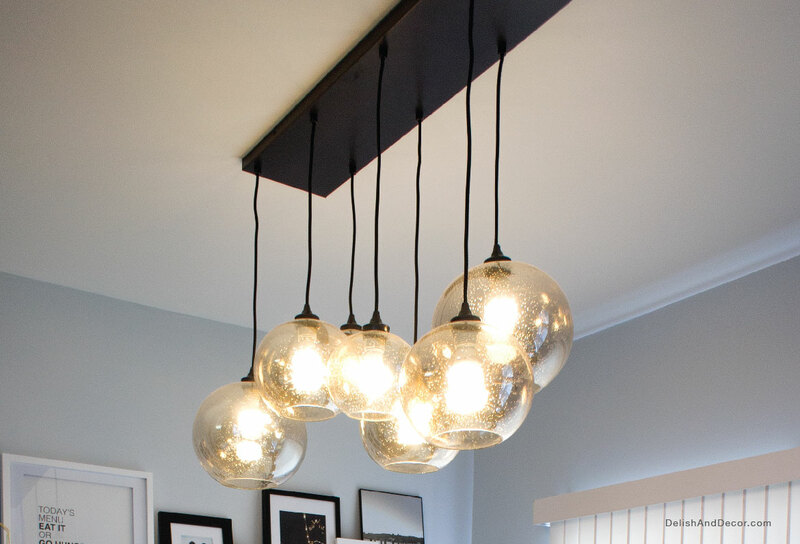 I have been searching for the perfect one for awhile and came across this orb light chandelier from West Elm. The price of this light fixture is a little bit more than what I want to spend so I shopped around but I kept coming back to West Elm website…so I finally bought it. It’s totally worth it. It gives me wow moment every time I turn the light switch on. 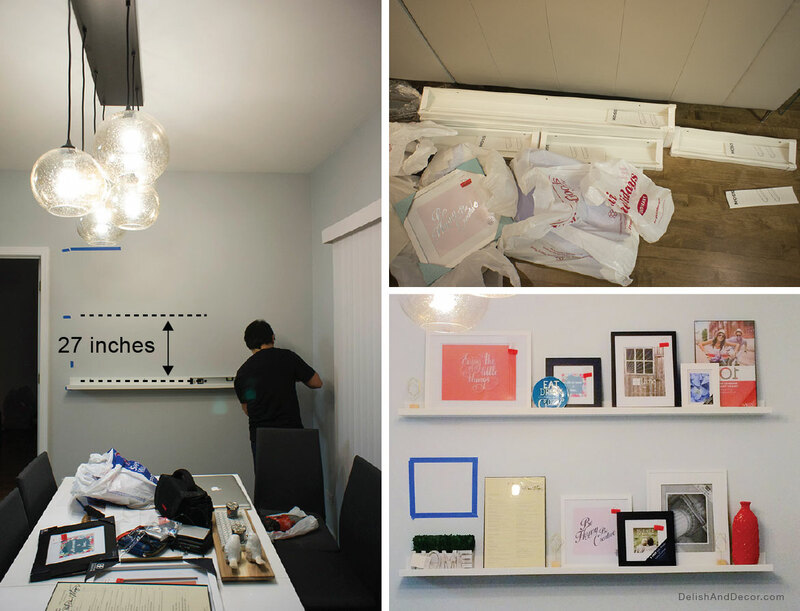 My original plan for this blank wall was to hang picture frames. But that would be too flat, the wall need a little more dimension. I thought about using floating shelves but the shelve is bigger in terms of the depth. 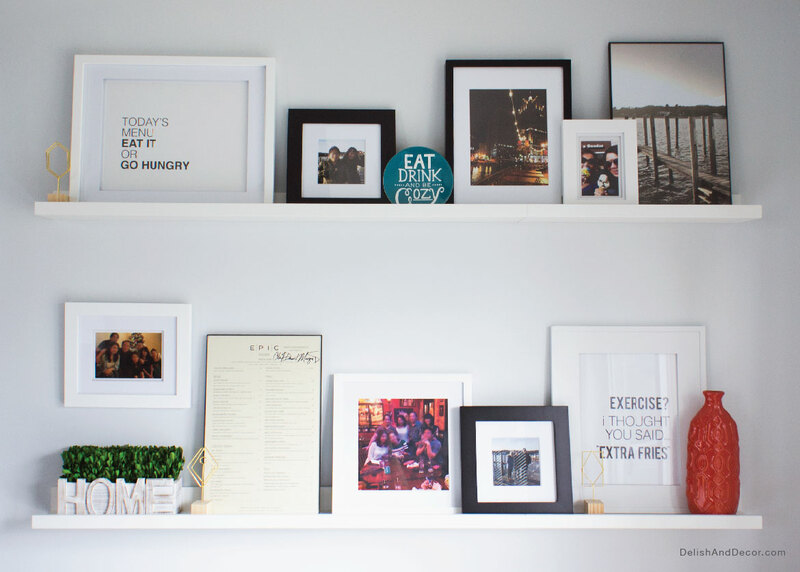 The depth of the floating shelve will extended too much for this wall and for this space. So I went with picture ledges instead, it’s like a floating shelve but slimmer. It would help add some dimension to this wall. The good thing about picture ledges is that it adds a personal touch. It is easy to swap the frames in and out throughout the seasons. It also creates interesting display to the wall by adding decorative objects. 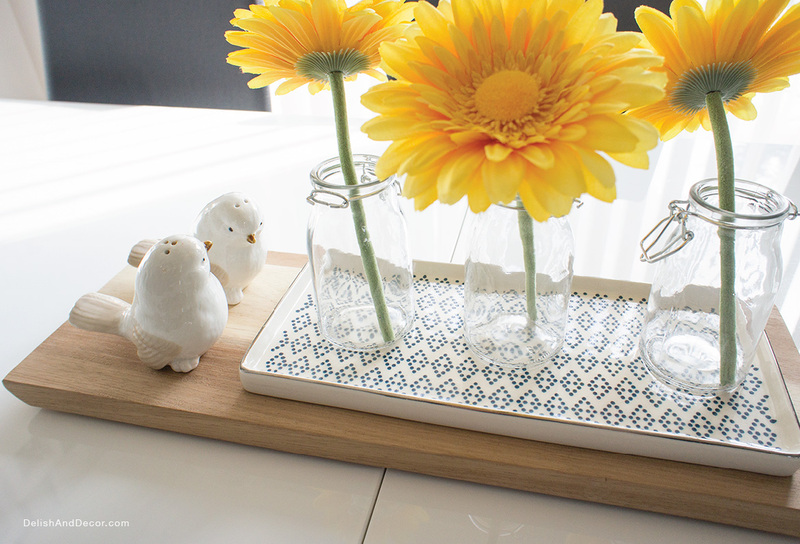 Here’s the link of how I made dining table centerpiece. Here’s the link of how I arranged the picture ledges.